Okay, first let me say that I think it’s good this series is over. For me at least. I believe I have spent more time on this one post than is good for me. So, we have finished Season 2 with a murder trial, a proposal and some awfully pretty snow scenes. For this last post of the Downton Abbey season (what WILL I find to blog about next year when it comes back!) – I am focusing on the bedrooms. 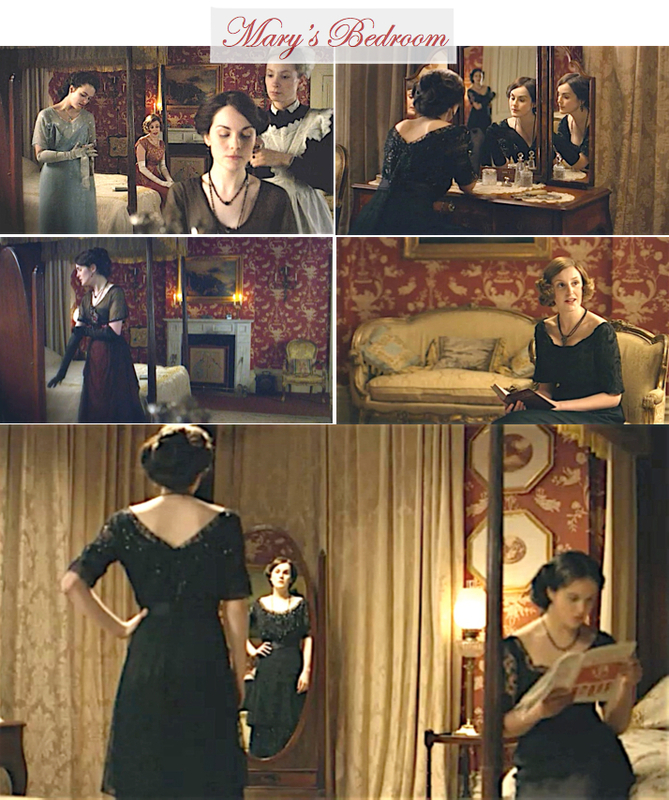 Eldest daughter Lady Mary’s bedroom is the setting for many scenes of the Crawley sisters and their mother, the Countess Cora. Not to mention the demise of the unfortunate Mr. Pamuk. This is clearly the hangout room and I don’t believe we ever saw other other sisters’ rooms. Cora, Countess of Grantham’s bedroom was light and bright as compared to the other bedrooms. 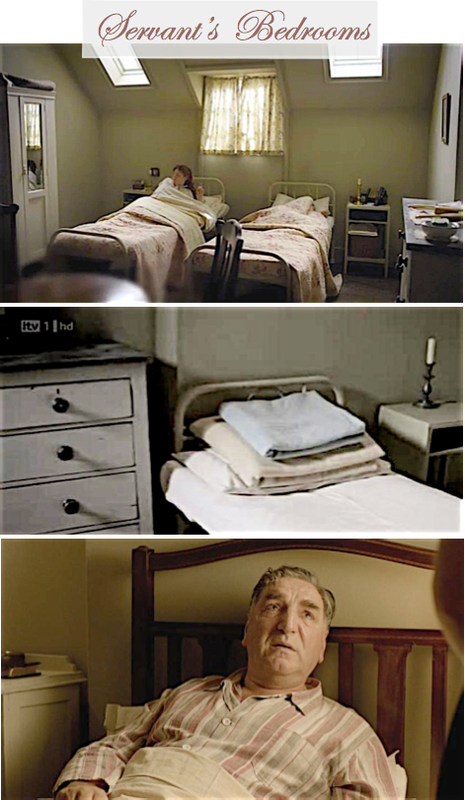 I did note, however, that the bed changed between season 1 and season 2. The image below is one of the room as it is today. 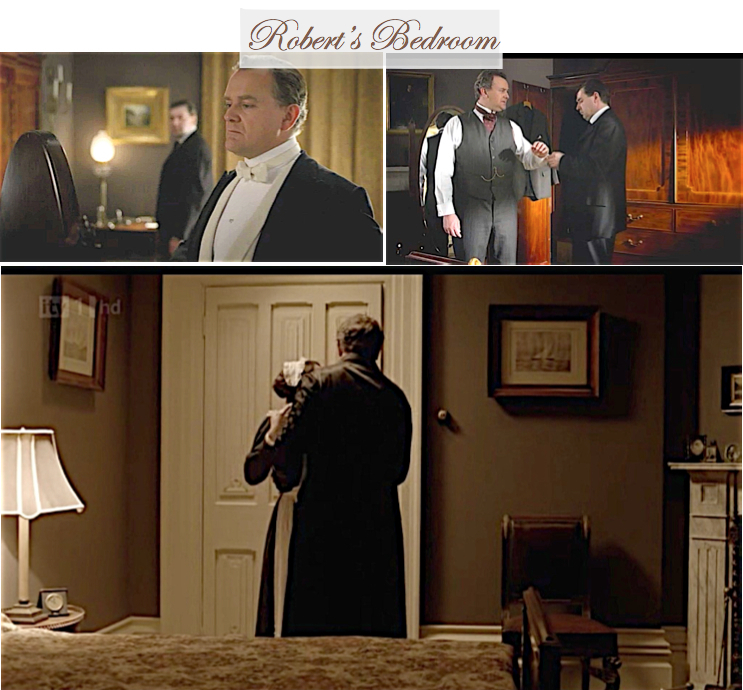 Robert, the Earl of Grantham made use of a small bedroom and dressing room adjacent to his wife’s much larger bedroom. It tended to be fairly modest in decor, although it does feature some pretty spectacular clothes cupboards. A busy house, DA was always filled with guests, so we got to see several different guest rooms. Upper left features a well decorated room befitting the status of the Duke who slept there. (He had status, but was a creep!) Upper right is the room set aside for Sir Richard, Mary’s overbearing ex-fiance. Note the image below shows this same bedroom as it is today with the curtains wide open. Lower left features a lovely bedroom that was given to footman William as he lay dying. He was accorded this honor because he saved the life of Matthew, the future Earl of Grantham. Before dying, he married kitchen maid Daisy. Lower right is the bed sweet Lavinia, Matthew’s fiance, died in of Spanish flu. I believe that the yellow bedroom below is this room as seen today. By contrast, the servants bedrooms are very simple and neutral in tone. Not uncomfortable looking, they have a sweet homey feel to them. It is notable that Mr. Carson, the Butler and highest ranked in the staff would have a finer bed and room than do the rest of the servants (image 3). And below is my weekly “Get that Look” to create a fairly close copy of a DA bedroom. Click the image to go to all the links for these beautiful furnishings. 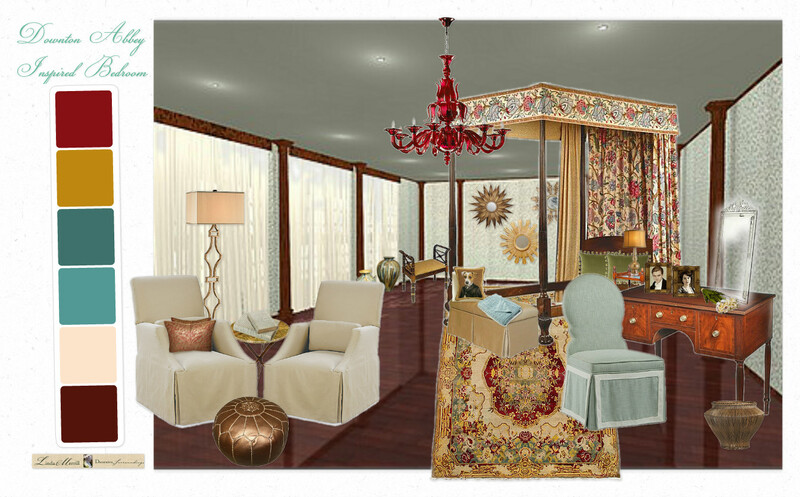 And below, I imagine a more modern take on a Downton Abbey bedroom for a modern couple. Perhaps Matthew and Mary’s descendents? Some furnishings would be the same as they ever were, and others might be a little bit updated. Click here to Olioboard for more detail. 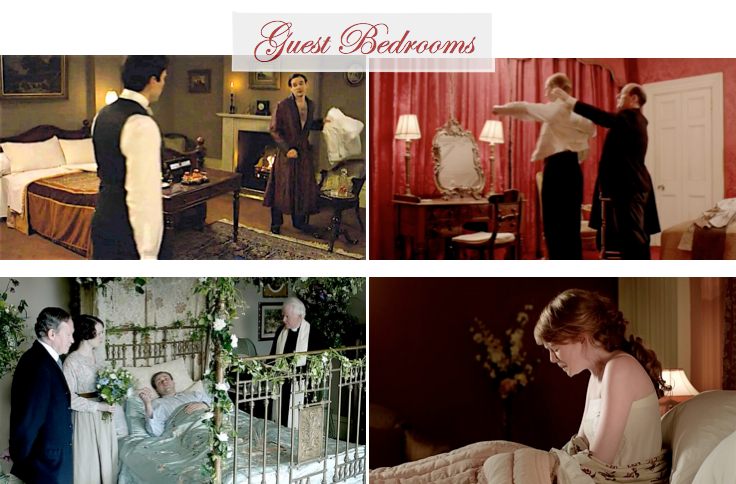 Visit my Downton Abbey Bedroom Board on Pinterest for additional images, links and credits for all of the above above. A huge THANK YOU to the Earl and Countess of Carnarvon for keeping up the biggest star in all of Downton Abbey – Highclere Castle. 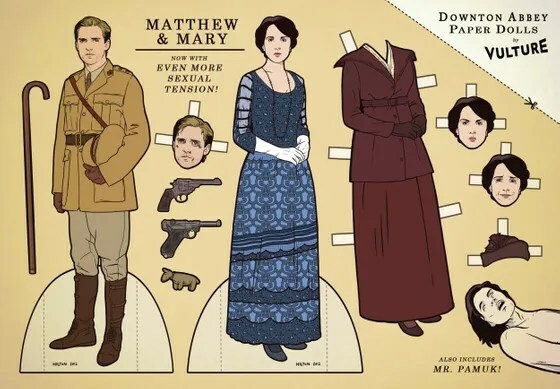 In the event you can’t wait till January 2013 to get your Downton fix, click here for a very fun set of paper dolls – so you too can play mischief with the lives of the folks both upstairs and down. Live the Fine Life Blog offers a take on a completely different space – Aunt Rosamund’s London townhouse. Very sophisticated! And finally, I wanted to acknowledge the work of the art director and set decorator’s on this show. While much of Highclere Castle is used as is, there is still a considerable level of attention to detail that goes into creating the right look for a period drama: Donal Woods, Production Design; Mark Kebby and Charmain Adams, Art Direction; Judy Farr and Gina Cromwell, Set Decoration. All were nominated for Emmy awards this year. Whew! Good night Downton, until 2013!